French Guiana is a French overseas territory in South America. It is bordered by the ocean, Brazil, and Suriname. It is a beautiful region, very colorful, where you can enjoy a lovely vacation. You can admire the coastal plains, the hills, and small mountains. You are free to explore them all and create beautiful memories. The first thing you need to check before getting on a plane is whether or not you need a visa. While French Guiana is French territory, it is not a part of the Schengen Area Agreement, although the Schengen acquis applies for the most part. There are some restrictions and limitations for some nationalities, but the list of visa waiver countries is quite extensive. Chances are you are going to find yourself on it. For one thing, the EU citizens have the same rights in French Guiana as they have in France. As an EU citizen, you can travel to French Guiana and stay there indefinitely. The rest of the nationalities can stay for 3 or 6 months without a visa. 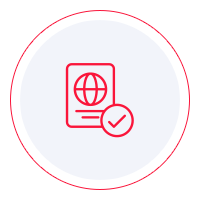 To check where you stand on the visa aspect, you can use iVisa’s Visa Checker. Just select your country of origin from the list and set French Guiana as your destination. It will show you what you need to know in an instant. What all travelers must have, disregarding the nationality, is a Yellow Fever vaccination certificate. You will not be allowed to board the plane if you do not have one, and if you travel by land, you are not granted passage. The Yellow Fever immunization is mandatory, so make sure that you pay your doctor a visit before departure. Leaving documentation aside, you will like French Guiana. The climate is tropical, a little bit humid, but the seasons are not very different as far as the temperature is concerned. You can enjoy the tropical weather while you sit on the beach and sip a cold beverage. Or you can go and explore the vast wilderness. The hill plateaus and the Tumuc-humac Mountains are not to miss while in French Guiana. As to how you can get to French Guiana, you have multiple options. You can take a plane and land in Cayenne. Here is the only international airport in French Guiana. You can choose Air France or Air Caraibe, whichever is the most convenient for you. Also, you can travel by boat since the North Atlantic Ocean borders the territory. Lastly, you can get in French Guiana by car from Brazil or Suriname. Getting around French Guiana is pretty easy. You can travel inside the country by bus, but you need to know that the buses do not come as often as you would like. There are only a few of them per day, which can be a bit frustrating. Taxis are very easy to find, but the fares are quite expensive. Renting a car is yet another viable option, but do not expect to see roads in the inner parts of the country. The Cayenne Airport has flights to inland cities, but as you can expect, the plane tickets are not the cheapest options. That is why a lot of people travel by boat. It may be slower, but the fares are fit for a decent budget. Before traveling to French Guiana, you should learn some basic French. Not many people understand English, although the officials might. The rest of the population speaks French and Creole. Since there are any Brazilians and Dominicans in French Guiana, Portuguese and Spanish are also common. The food in French Guiana is fantastic. Their diet consists of a lot of fish and seafood, but the locals know how to make it delicious. However, you need to be careful because the people of French Guiana are quite liberal with spices, which can be a bit rough for your stomach. Surely you have heard about Cayenne pepper, right? Where do you think that name comes from? Just to make sure that you can eat the food, you can mention to the wait/chef that you want your food less spicy than usual. The bottom line is that French Guiana is an interesting region that is worth visiting. There is a lot to explore, the people are nice, and you will have a lovely experience. The wilderness and the rainforest will charm you into coming back.